Take What You Need is an innovative interchangeable bar jewellery line from Dutch designer Mi Moneda. Adapted from the phrase "Take what you need and give what you can," inspiration is key in this collection. Each bracelet or necklace features a bar engraved with the phrase 'inspire', since every piece of jewellery inspires the wearer to make it their own. Collect the interchangeable magnetic bars and customise your bracelet or necklace at any moment to suit your needs, whether want need a boost of strength, courage, positivity or passion! 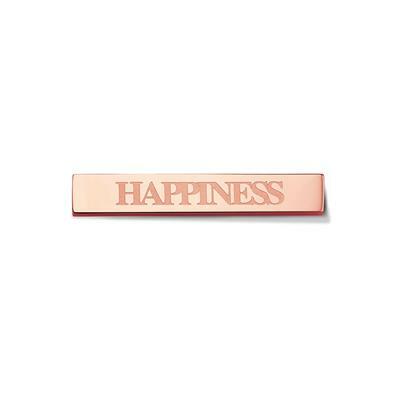 Embrace positivity with this beautiful rose gold toned Stainless Steel bar, engraved with the word "happiness" and a dainty bow motif. Add this interchangeable bar to your Take What You Need bracelet or necklace whenever you need a smile.